Back, neck, and shoulder pain are a common ailment in modern society. Driving is one of those times when pain can flare up. It may seem like we’ve got it made since we’re not walking or riding a horse and buggy anymore, but bad driving posture or seat position while driving can lead to serious lower back pain, a stiff neck, or a stiff shoulder. If you are experiencing neck pain, lower back pain, a sore neck, a headache while driving, driving pain, or driving stress there are some adjustments you can make to improve the problem or even eliminate driving pain. There are several factors that can contribute to neck, back, and shoulder pain while driving. One of them is the jolting and vibrations caused by the road. Another factor is that some car seats offer no lumbar support. Poor seat positioning can contribute to pain. If your seat is too far from the pedals, your back can be strained to reach them. If your seat is reclined too much, your pelvis may tilt backward, causing you to strain your neck just to look forward. If you drive a manual vehicle, constantly pressing the clutch can put a strain on your lumbar disks. Adjustments to your seat and the area around your seat can make a big difference in whether or not you are experiencing pain while driving. The following checklist can help you find the right position for optimal comfort while driving. 1.Make sure your seat is positioned close enough to the steering wheel that your feet can comfortably reach the pedals. All controls on the steering wheel and console should be reachable with no strain. 2.Your seat should be high enough that your hips rest even to or just below the level of your knees. Some seats don’t allow this kind of adjustment for driving posture. A pillow may be required to lift your seat up. 3.You should be the appropriate distance from the steering wheel so that your hands can rest and 10 and 2 o’clock position or where your elbows can rest on the armrests. 4.Your seat back should be positioned so that you can sit upright in a natural way, usually between 95 and 100 degrees. This will allow you to look directly through the windshield without causing a stiff neck or a stiff shoulder. 5.Adjust your headrest so that it hits you at the level of your eyes. You should be able to rest your head without tilting your neck. Resting your head periodically can help you avoid a sore neck. 6.Eye strain can cause you to tilt your neck forward as you struggle to see. This can cause a headache and a stiff neck. If you need them, wear your corrective lenses. If conditions are such that you cannot see the roadway clearly take a break for the night or until the back weather clears. 7.If your car has it, adjust your lumbar support so that it supports the whole curve of your lower spine. 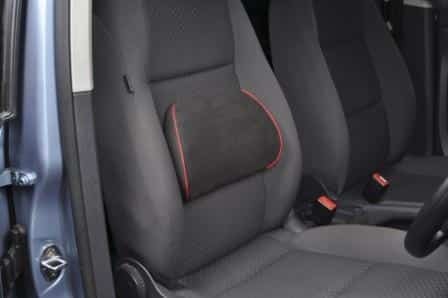 Many cars do not offer lumbar support or adjustable lumbar support. If needed adjust the area with a support pillow or a rolled up towel. 8.Don’t keep things in your back pocket that can take your back out of alignment. Phones and wallets should be stored in the console while you are driving. 9.If you know that back, shoulder, and neck pain are a problem for you, build in time to take quick breaks on long drives. Stopping every couple of hours for a few minutes at a time can make the difference between a comfortable journey and a painful one. 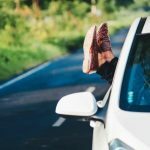 You might want to look into learning some stretches you can do while driving and while taking your breaks that can add to your comfort on long trips. All these small adjustments can make a big difference for you when you are driving. Even if all these adjustments are made perfectly, you may need to consider getting more help for your pain, especially if driving is part of your occupation. Physiotherapy can help if you have chronic pain, strain, or sprain. Physiotherapy can help 80 percent people with a musculoskeletal disorder overcome their back pain. Driving can be a necessary part of your life. If it’s causing you pain and the adjustments listed above aren’t solving your problem, it may be time to see a physiotherapist. A physiotherapist can help you identify the cause of your pain and give you tips on healing and preventing the pain. They can help you treat your pain with stretching, interferential electro therapy, and therapeutic exercises and many other techniques.